I am launching very soon a series of posts talking about How to Meditate. That is my word this week. Meditate. Lots of people dismiss meditation as a bit airy-fairy, a bit hippy, or something Buddhist Monks do, that takes a lifetime of training to ‘do’. I have been teaching meditation and relaxation classes for over five years, and I hold a weekly class at my local cancer support centre, for sufferers and their supporters. Meditaton is amazing! It is proven (I am afraid I can’t quote you the sources right now) to lower blood pressure, ease anxiety, improve general mood and well being, and increase your abilty to cope. Meditation is wonderfully helpful. I look forward go reading your posts. I’ve been trying to attempt mindfulness meditation for my health, I’m hoping it will assist in my pain management like other forms help in other areas of my life. 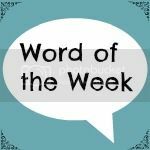 An excellent word of the week! I have a friend who meditates regularly and swears by it, so this week I have had a go. Not sure if I’ve been doing it right though. Will watch out for your posts and see what I can learn! I would love to find the time to meditate – I know it would be so worth it but other things keep getting in the way! When I was teaching I experimented with introducing it to morning registrations. It was amazing what an impact even 5 minutes had on teenagers – they were cynical at first but really got into it!